Astronaut Kirby Lv 10 is the advanced form of Astronaut Kirby Lv 5. 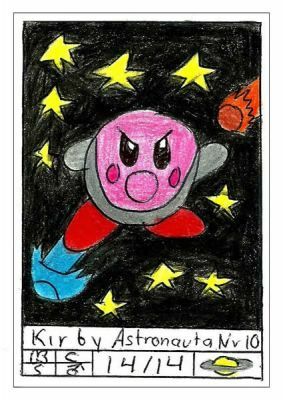 Astronaut is one of the most cool abilities of all because with it Kirby can use the powers of the universe and the stars to defeat any opponent that appear in his way and with it Kirby can explore the mysteries of the infinity space. Astronaut (The true name of the ability is Space, until Lv 25 the word Astronaut is changed for Space) only appears in KTCG and KAA, if it appeared in other games it become very useful. This ability can use many kinds of attacks and skills, for example: it allows shoot stars and comets, open black and worm holes, changes the gravity, distort the Spacial Line and travel through of the galaxies. But this ability is very rare to find in any world, it has more chances to appear in the Spacial Worlds (Candy Constellation, Spectacle Space, Nebula Belt, Gamble Galaxy, among others). If you can get it you'll have the power of the universe in the palm of yout hand. For the moment this ability doesn`t have a helper or an enemy that give it, but if you have and idea, please call me. In this level he is using the attack called: Comet Kick. You Could probably combine This deck with Eternal Eclipse. Possiblely i'll can combine this 2 deck in one, i need think in it. Thanks for the idea.